I spent a lot more time exploring Ginza on this trip, and I’m glad I did, because in the basement of the Mitsukoshi department store I discovered the new Tokyo branch of New York’s Dominique Ansel Bakery. I arrived late in the day so there were no cronuts left, but I did snare this little guy – a strawberry and sake daruma cake (¥756), which was so Japanese I couldn’t resist. The cake was a reasonable size, and (being in Japan) packaged carefully to avoid any damage while being transported (no dine-in at this location). The daruma is traditionally designed to help with wishes – one eye is filled in when you make the wish, the other once it is fulfilled. Luckily I could just eat both. They were white chocolate discs, and a perfect start to the flavour festival of this cake. The majority of the inside is made up of a strawberry gel, plus sake lees and lime zest mousse, which was creamy, tangy and with a subtle sake flavour. The textures were soft and springy, and when I wanted something firmer, I could slice into the almond financier cake at the bottom for balance. Yum, yum, yum. 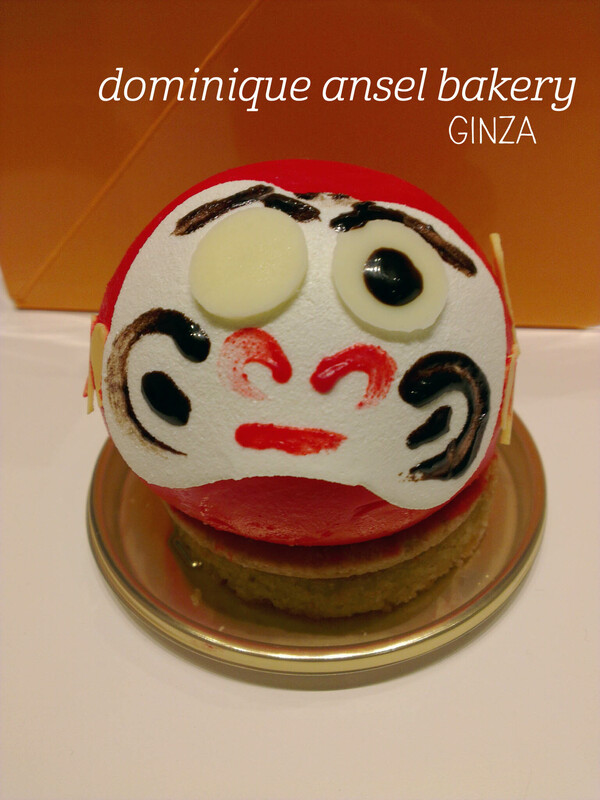 This entry was posted in Japan, Tokyo and tagged cake, dessert, japan, sweet, tokyo. Bookmark the permalink. I loved Japan when I was there many years ago. Have fun, the food is yummy!! Thanks Cynthia! It’s my favourite destination for that very reason!